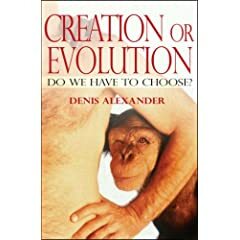 I am posting here a link to an article “Viva evolution” written by Denis Alexander, a Christian Biologist, which appeared in the last issues of Third Way Magazine (a respected UK Evangelical Magazine). This article is to give a flavour of his new book Creation or Evolution – Do We Have to Choose? which is published this month by Monarch. In this short article, among other things, he seeks to encourage the Evangelical Christians to celebrate Darwinism and he tries to argue that accepting evolutionary theory is compatible with faith in a Creator God. That was an interesting article and an even more interesting set of 59 comments following it! I think my ‘model’ matches one or more of those described in the comments, but I think Denis Alexander doesn’t take enough account of the ‘holes’ in the three mechanistic-type models he proposes. However, he does observe that God is not only the Creator but also the Sustainer of all things. This implies that God is actively involved in Everything and therefore what appears to be ‘mechanistic’ (i.e. happening without God) may well not be – and we cannot determine whether or how He is involved. Allowing for God to be invisibly and undetectably involved in the development of complex life seems to resolve the theological difficulties that some people have with the scientific observations, the resultant theories, and the biblical accounts. Thanks Stewart for your comment. I posted this as I notice that American influence, and preachers of ‘intelligent design’ seem to invest more and more in the UK. I also seek to keep in touch with some of my friends in the States and Romania and there it seems that many Christians are put to choose between their faith and evolution (absurdity in my view). Last year when I was in Romania I got speaking to my father, who suffered immensely for his faith during two different regimes. When I told him that I see no reason for us as Christians accepting evolution, he almost had a heart attack and he started to doubt my ‘salvation’. I am not sure if you saw last week another good article in the Guardian, God and Evolution can co-exist, by Justin Thacker, the head of theology at the Evangelical Alliance.